The suede ankle boots shown here are often called 'Desert" boots or "Chukka" boots and are made usually from soft leather or suede with a crepe rubber sole. They are an easy shoe style to adapt to many dolls. The ones shown here are removable and made to fit a 1:12 scale dollhouse doll. Thin leather, suede or Ultrasuede (TM) to make uppers and a set of soles to fit your doll. Choose a weight which looks in scale when held against the doll's ankle. Thinner leathers are best as they are easier to fold over the insole. Note: If you do not have easy access to thin leather, use the method to make faux leather using acrylic paint and interfacing or fabric. Strong, Tacky Glue. (we used PVA glue, you may find rubber cement works well for some leathers. Fine thread and a fine sewing needle (we used a size 12 sharp for the thin Ultrasuede shown here). Heavy thread, crochet cotton or jewelry lacing for the boot laces (choose something which will look in scale for your size of ​a doll), along with a needle to thread it. You may also want some beeswax to stiffen the thread. Translucent (porcelain) polymer clay for the 'crepe rubber' shoe soles. Scrap of Fabric or Interfacing to make a pattern. Fine tipped pencil or mechanical pencil for pattern. For larger doll boots, you may also want to use fine eyelets and an eyelet setter for the lace holes. To fit a pair of ankle boots to a doll, the first step is to mark an outline of the doll's foot onto paper for the insole and outsole for each foot. We're working with a plastic 1:12 scale doll whose feet clean up easily so we are using a mechanical pencil to outline her foot. If you are working with a collectible doll or an expensive resin bjd, you may want to wrap the foot in plastic wrap before you outline the doll's foot. You can leave the plastic on to protect the doll's resin foot throughout the assembly process. Make sure you mark both feet and label your pattern L for the left and R for the right. The pattern for the insole should be the pattern you trace from the foot. To make the shoe soles later from polymer clay, or the outsoles from a bit of leather, you may want to make a second pattern by drawing an outline slightly outside the lines you drew by outlining the foot. If you want to change the toe shape for a different style of boot, you may want to extend the sole pattern from the tip of the doll toes. To draw the side pattern for the back piece of your doll boot, cut a section of lightweight fabric (we're using interfacing) which is roughly 1/8 inch taller than you want your boot to be, and long enough to go completely around the doll's foot. Set the fabric /paper so the edge is roughly 1/8 inch below the sole of the doll's foot (or up to 1/4 inch for larger doll shoes). Hold the back of the pattern piece tight to the doll's heel as shown. Use your pencil to mark the line of the sole, and to mark the line up from the sole to the center of the foot which will be the sewn side edge of the shoe. See photo and finished pattern example in step 5 of these instructions. Make another mark to connect the top of the side seam line with the center of the doll's foot at the ankle. This will be the laced section of the boot that sits against the tongue. Mark both sides, along with the center of the doll's heel. See step 5 for the finished pattern example. To make the toe cap and tongue pattern for a doll-sized ankle boot/desert boot, wrap a small piece of fabric interfacing or fabric (or tissue paper) over the toe section of a doll's foot as shown in the photo on this page. Use a pencil to mark the line of the sole along the interfacing and draw a line on the fabric marking the center of the foot down to the toes. Mark the width of the boot tongue on either side of the center line. See the finished toe cap and tongue pattern in the next step of these instructions. Using the pieces you marked in steps 2, 3 and 4, you should have pieces which resemble the ones in the photo on this page. The side boot pattern shows the sole line as the gathering line for the boot sides, with the side seam coming to a point with the lace section. The top cap and tongue piece show the sole line around the toes, along with a 1/8 inch 'seam line" which will be tucked under the insole to form the toe cap. The toe section needs to be long enough to come back under where you side seam will be sewn, so test fit your side pattern over the doll's foot with the rough toe cap pattern in place before you cut the final version of the toe cap pattern. The same pattern you cut for the outsole, can be used to make the polymer clay 'crepe rubber' soles. If you have more than one doll, add the words ankle boot and the doll's initials to the pattern pieces so you can use them to make a range of footwear for that doll. Cut versions of the pattern pieces for your doll's ankle boots/desert boots/chukka boots in your chosen leather. As shown we are using a pale green lightweight Ultrasuede (TM) fabric for our dollhouse doll desert boots. You will need two toe cap pieces in leather, two side pieces in leather, and two outer soles in the same leather or suede. You may want to leave cutting the outer soles until you have assembled the boot uppers and glued them to the card insoles. The thickness of the leather may change the shape of the outer sole you require. Using a fine needle and thread, stitch two rows of running stitch slightly towards the sole side of the sole line on both side pieces and both toe pieces. If possible set your rows of running stitches so they alternate slightly from one row to the next (see photo). That way when you gather your stitches, the "fold' or gather lines will be finer and less noticeable. Leave the ends of your gathering thread free for use later. Set the toe cap onto the foot of your doll and set a side piece against it, checking that the side piece goes all the way around the doll's foot and that the tongue of the shoe and the sides of the shoe are centered on the doll's foot. Use a pencil to mark the toe piece where the side seam touches it. Make sure the gathering lines all line up on or slightly below the sole of the doll's foot. Remove the shoe pieces and use a simple backstitch to hand stitch the side of the shoe to the toe piece. Curve the side piece over to the other side of the toe piece and stitch the second side, taking care to keep the toe piece centered on the side piece, with the gathering stitches lined up on the toe and side, and with the tongue free. If you are working with a collectible doll or collectible bjd (ball joint doll) wrap the doll's foot in cling film to protect it while you assemble the boots. With the side seams sewn, place the uppers of your ankle boots/desert boots on your doll's foot. Check that the sides are centered on the toes and that the lines of gathering sit along the sole edge of the doll's foot. If there are problems with the side seams, carefully unpick the seams and sew them again. When you are sure the boot seams are correct, gently tug on the gathering threads (both at once on any edge) to pull the lower edge of the boot side and toe cap so it can be folded over the sole of the doll's foot. Spread out the gathers evenly so the curve is gentle and even. Set your light card insole onto the doll's foot. Apply an even coating of glue to the bottom of the insole. Take care to apply the least amount of glue you will need so the glue won't squeeze out onto the doll's foot above the insole. Using tweezers, carefully turn the gathered leather/suede over the edge of the doll's foot and press it into the glue on the insole. If necessary trim the leather to keep it from making large lumps. Keep the gathers as even as possible as you glue the leather/suede to the insoles as shown. Press the leather carefully against the insole and the doll's foot. Hold in place until it grabs. Set the boot/insole assembly aside to dry (leave on the doll's foot at this stage). When the boot uppers are securely glued to the insoles, take a carefully trimmed outer sole and place it over the base of the doll's foot to check that it covers the insole and matches the edges of the boot sole. At this point, you can remove any stitches of the gathering lines which show above the sole line of your doll's boots. If the fit is good, glue the outer sole over the insoles and bottom edge of the upper boot layer as shown. If the fit is not correct, adjust the cut or make a new outer sole before fitting it to the boot. For larger dolls, you may want to leave cutting the outer soles until you have the upper boot glued to the insoles. The thickness of the leather may change the shape of the outer sole you need. You can make faux 'crepe rubber' soles for doll shoes using translucent (porcelain) polymer clay. Roll out a thin even layer of clay, and use your paper pattern for your doll outer soles to mark 'crepe rubber' soles for your doll's desert boots. Cut the soles around the marked pattern. You may want to cut the soles slightly larger than your outsole pattern as polymer clay does shrink slightly when cured. Use a tissue knife or modeling tools to create a textured pattern of lines on the base of your polymer clay soles. You can use a tiny rubber stamp or embossing tool to mark the soles with a pattern if you prefer. Press an embossing tool or crumpled foil against the sides of the soles to mimic the pebbled texture of crepe rubber soles. Bake your polymer clay on a flat surface according to the package directions with the shaped section of the sole facing up. When the soles have cooled, check them against the soles of your shoes and trim or sand if necessary. To finish your doll's desert boots, glue the "crepe rubber" soles to the base of the outer soles of the boots holding them in place until the glue grabs. Allow them to dry thoroughly. 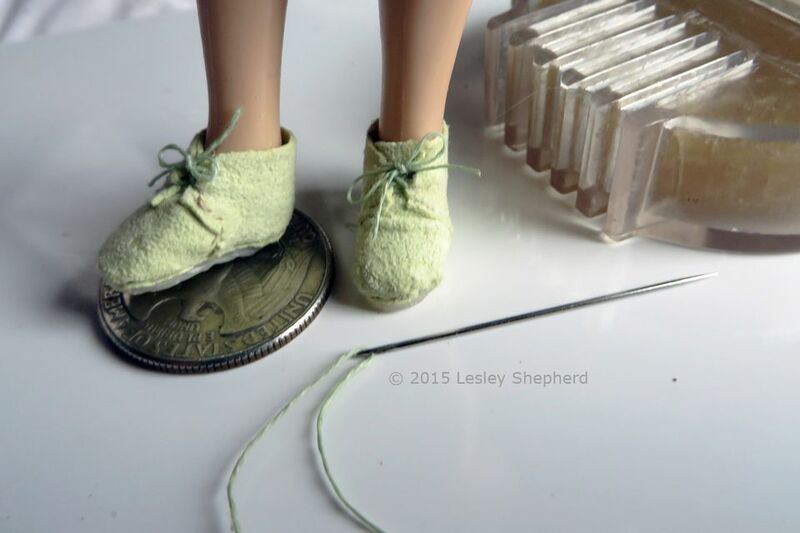 When the soles are dry, thread a needle with your choice of boot laces (for the 1:12 scale doll we used fine crochet thread) which has been run over a wax candle or beeswax to stiffen it slightly. You can remove the shoes from the doll at this point or leave them in place and lace them up. To create the effect of laces, take your thread through the sides of your boots just above where they meet against the tongue. (See photo on the first page of these instructions) Pull the thread through both sides of the boot as if you were threading boot laces, leaving half of your thread free below your first stitch. Take your needle over to the opposite side, just near the top of the boot, and take it out from behind as if the lace is coming through an eyelet. For larger doll boots, you may be able to fit small eyelets for your boot laces. Remove the thread from the needle and rethread the opposite end of the thread through. Take a stitch to the opposite side of the boot. Use tweezers to tie a bow at the top of the boot pulling the sides together. Experiment with different leathers and side stitch patterns to make a range of ankle boots for your doll. Have fun!